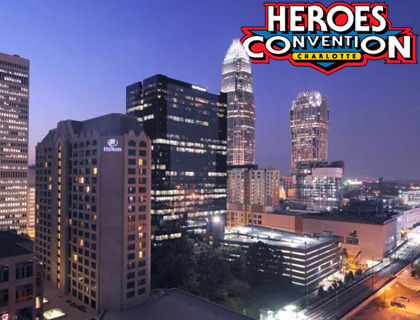 THE HEROESONLINE BLOG | HEROESCON 2014 :: HILTON SPECIAL RATE IS LIVE! HEROESCON 2014 :: HILTON SPECIAL RATE IS LIVE! Westin rooms at are convention rate are sold out for HeroesCon weekend! Luckily for you, Heroes Head Honcho Shelton Drum has worked out a deal with the Hilton Charlotte Center City right on the other side of the Convention Center. A special rate of $124 is availablenow but we are predicting a quick sell out considering how fast the Westin blocks sold. So, book now! See you in June! And don’t forget your 3 day passes! ← HEROESCON 2014 GUEST LIST UPDATE!